Gore’s official opening was last week, but I’m calling this past Saturday the unofficial opening. 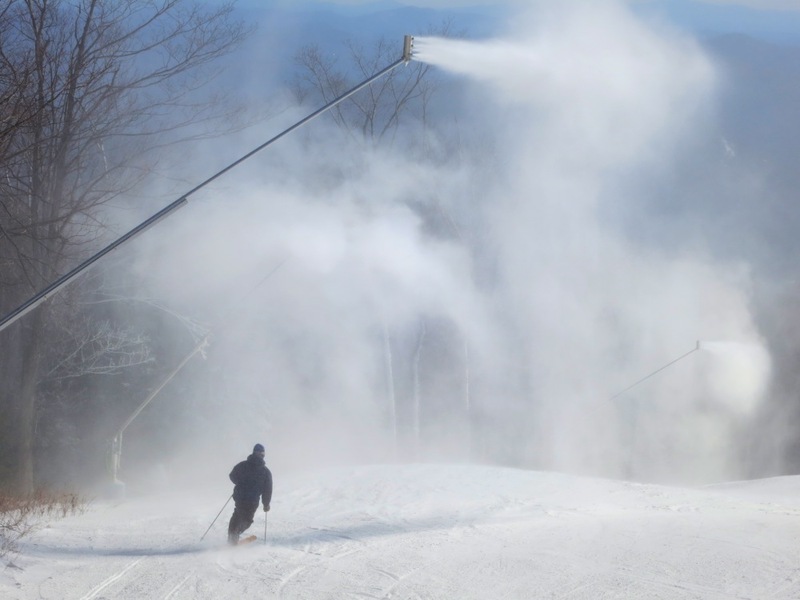 After a big warmup on Friday, a true arctic cold front swept through after midnight, putting a lot of pressure on the groomers. 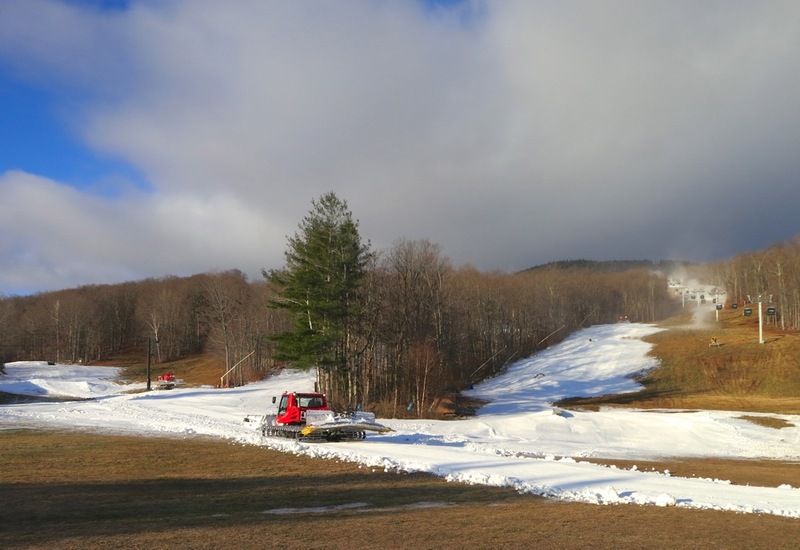 Gore waited as long as possible before grooming, not that the snow really “drained” much in a few hours. Still crews pushed it to the last minute and used two Pisten Bullys to get things done just as the Gondi was going off at 8:30. The crazy thing is — when I was taking these photos — I was pumped. It was cold with snow in the forecast and guns were going off across the East Side. There had to be something to turn on, in 1500 feet of vert. Surfaces were bomber with little stashes of loose snow here and there. In a couple spots you could turn in some manmade blowby, but there was no snowmaking going on any open trail. I spent the day alternating between the Gondi and the Sunway Double. The people I talked to were smiling. Wall-to-wall surfaces from Bear Mountain to the base, before Thanksgiving, is money in the bank. By the end of day, it was snowing at a good clip and things were definitely improving. I’d say we got three or four inches in a two-hour blast, with most of it falling in about 45 minutes. It made conditions better and gave us something to think about for the next day. Sunday it was cold! Six degrees and it was windy. NWS was calling for 25-35 mph winds with gusts up to 50. I was surprised and pysched that the Gondola was spinning when I arrived. 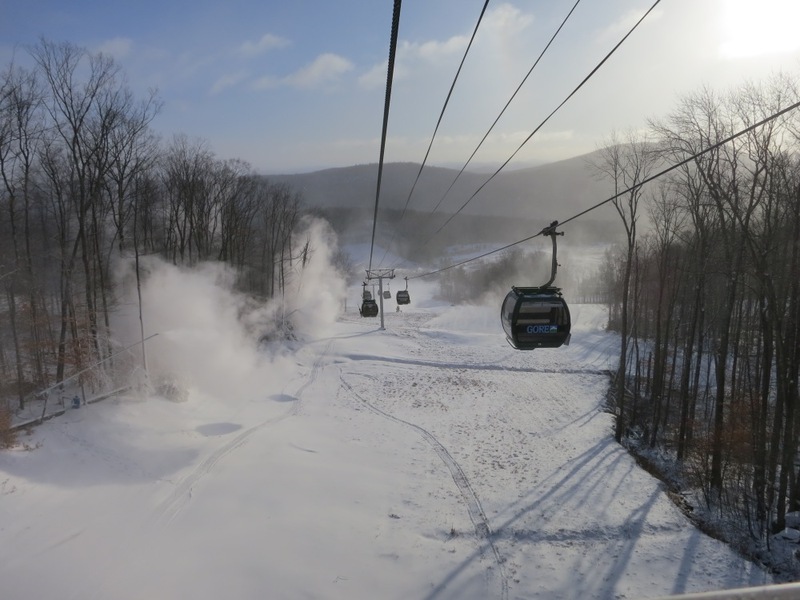 Mike Pratt said that as long as we run the lift slow, and watch it closely coming in at the top, it can run in some pretty big wind. After a run down Foxlair, we realized that Ruby Run was the way to go. Surfaces were fast enough so you could glide all the way to the saddle without any real effort. Once you arrived at the saddle there was a series of blasting fan guns, followed by a line of Low-E HKDs lining Upper Sunway. It was pretty deluxe to my ski starved eastern mind. This piece turned into a trip report more than a blog post, but for me the context is simple. This offseason there have been some events in life that have served to remind me that there is an outside chance I might not ski forever. 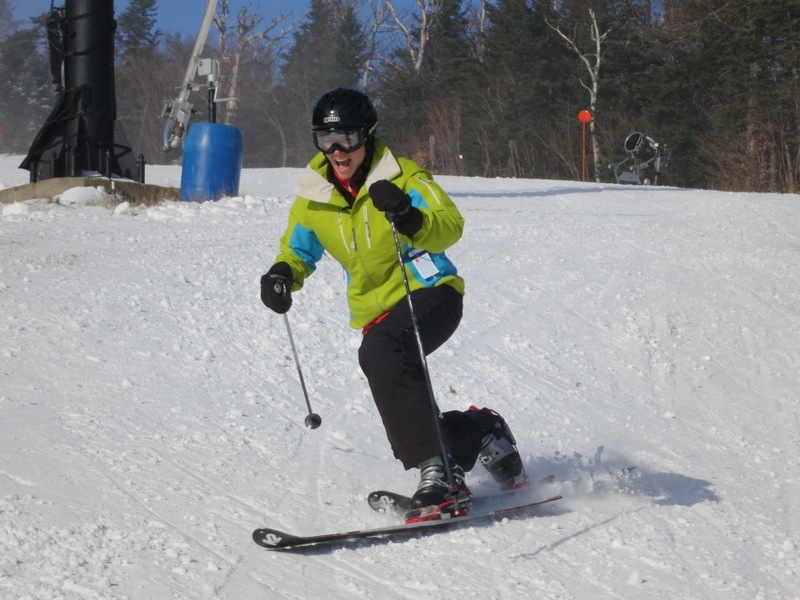 Ski days are not an unlimited resource. I’m going to continue to ski as much as I can, planning, driving, maybe rolling the dice in a few marginal storms. With any luck I’ll get my 35 days and 5 of them will be spectacularly memorable. That’s all I’m asking, really. Nicephotos, nice story. Got to admit, I’m tired of roller skiing. I’d say Martha has already been posterized. Nice shot! Thanks for the “season opening” story Harvey. I probably won’t be able to get started until after the holiday season, so it’s fun to have ski stories to read in the meanwhile. Love this site! Nice shot of Martha and classic EDeO! 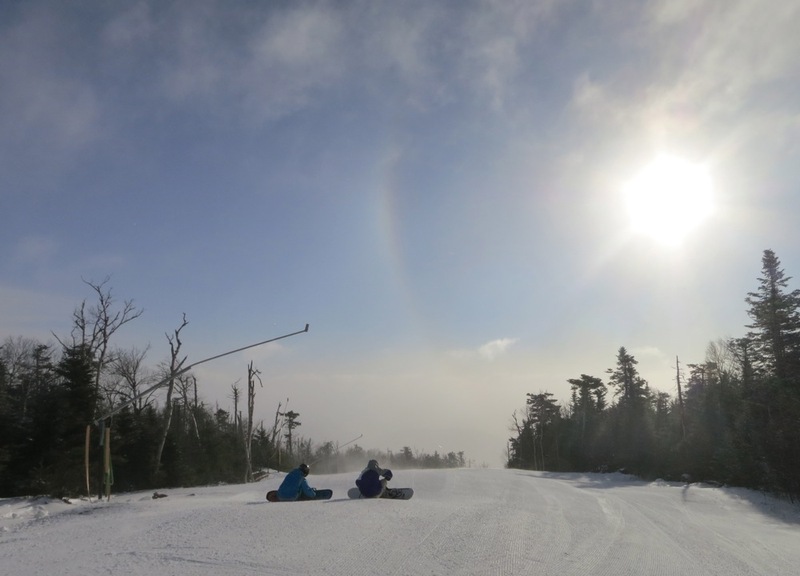 It was great to get out and ski with old friends and new ones. David welcome. I think the best idea is to join our forum and post your question in the Woodstove. I think you’ll get some good input.